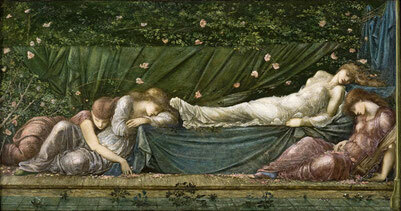 Sleeping Beauty (Briar-Rose), Germany (Grimm) - andrea-hofmann308s Webseite! get through the thorny hedge into the castle. But they found it impossible, for the thorns held fast together, as if they had hands, and the youths were caught in them, could not get loose again, and died a miserable death. Then the youth said, I am not afraid, I will go and see the beautiful briar-rose. The good old man might dissuade him as he would, he did not listen to his words. But by this time the hundred years had just passed, and the day had come when briar-rose was to awake again. When the king's son came near to the thorn-hedge, it was nothing but large and beautiful flowers, which parted from each other of their own accord, and let him pass unhurt, then they closed again behind him like a hedge. In the castle yard he saw the horses and the spotted hounds lying asleep, on the roof sat the pigeons with their heads under their wings. And when he entered the house, the flies were asleep upon the wall, the cook in the kitchen was still holding out his hand to seize the boy, and the maid was sitting by the black hen which she was going to pluck. He went on farther, and in the great hall he saw the whole of the court lying asleep, and up by the throne lay the king and queen. Then he went on still farther, and all was so quiet that a breath could be heard, and at last he came to the tower, and opened the door into the little room where briar-rose was sleeping. There she lay, so beautiful that he could not turn his eyes away, and he stooped down and gave her a kiss. But as soon as he kissed her, briar-rose opened her eyes and awoke, and looked at him quite sweetly. under their wings, looked round, and flew into the open country, the flies on the wall crept again, the fire in the kitchen burned up and flickered and cooked the meat, the joint began to turn and sizzle again, and the cook gave the boy such a box on the ear that he screamed, and the maid finished plucking the fowl.